Three sterling turns and an Oscar hopefully. A mother (Frances McDormand) personally challenges the local authorities to solve her daughter’s murder when they fail to catch the culprit. A brooding country noir riddled with black comedy. If it wasn’t for all the profanity, you could have said it was a Fargo sequel. Bold, brash and a little long in the tooth BUT a damn good watch all the same. 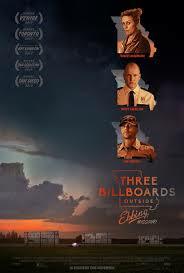 Funny how three billboards can cause so much trouble? Originally aimed at the local sheriff William Willoughby (Woody Harrelson), one woman’s crusade for justice causes a stir among the community. Frances McDormand is a brilliant actress. I knew exactly what she would bring to the table. That bitter Olive Kitteridge grit. Sharp tongued, outspoken, on the war path and not giving a damn who knows it. A powerhouse performance. She stole every scene. You really felt for her. Her frosty reception with the town priest and her discussion on the definition of the word ‘culpable’ was worth an Oscar nod alone. All aided by a sterling script, of course. Penned by none other than the In Bruges (Highly recommended) writer/director Martin McDonagh. The fiery quick witted dialogue delivered that sinister comical edge as Mildred dealt with all sorts of unsavoury characters as the townspeople soon let their feelings known on the billboards. An awkward trip to the dentist made for tense viewing. The pacing did test in places. Originally I felt the film slackened when McDormand wasn’t involved in the mix. A compliment to her performance. BUT it also allowed for some sterling turns from a highly talented supporting cast. Woody Harrelson was excellent in the understated role of Willoughby. A man desperate to keep the peace BUT plagued by his own demons and the system he had sworn to protect. A tragic hero if ever there was one. A performance full of nuance that knocked me for six. Proof that the Cheers star can act. I wanted more exchanges between the struggling sheriff and the militant Mildred. Despite her anger with the law, there was still respect between them. Caleb Landry Jones (Get Out) played the simple ad clerk Red Welby brilliantly. His run-ins with Mildred delivered several humourous encounters. Ol’ Tyrion (Peter Dinklage) was wasted in his small role (No pun intended). He did his best BUT then again, this wasn’t his story. I hope Lucas Hedges (Manchester By The Sea) isn’t going to be typecast in the grieving son role. He worked well with McDormand and I liked the fractured mother/son relationship. It was just a shame that he was pushed into the background. Especially after a heated “family reunion” with his deadbeat dad. The uneven middle act left me wondering where this was all going. The tone jumped from moments of violent, foul mouthed mayhem to ones of tearful reflection and sorrow. BUT as much as I was getting frustrated, I still wanted to seek out the end game. The always underrated Sam Rockwell nearly stole the show from McDormand. His character Deputy Dixon was a particular highlight. I loved the journey that this dimwitted racist country mama’s boy went through. A rollercoaster ride if ever there was one. I hated him, I laughed at him, laughed with him and by the end, I felt sorry for the poor schmuck. The second half of the film took a much more sombre turn than I expected. Especially when we delved a little more into Mildred’s and Willoughby’s background. It turned an incredibly witty black comedy into so much more as everything came to a thrilling and heart rending climax. The final act and the bittersweet ending spoke volumes as it tackled grief, anger, hate BUT most importantly forgiveness. It didn’t quite deliver what I expected BUT I was left smiling after experiencing this redemptive journey with Mildred and Dixon, in particular. Something I haven’t felt with any film in a while. Try not to buy into the awards hype too much and approach the film for what it is. A brilliantly acted and darkly comical tale of anger, grief and redemption.